Aarhus is a Danish city with a population of over 311 000 people. The city was founded in 770 by the Vikings. In the mid-tenth century the city was a large village, in which the residence of the bishop is located. Economic development of the city was crushed several times by wars that Denmark waged with neighboring countries. In the fourteenth century the city's population declined sharply due to an epidemic of plague. In 1536, in the city was held Reformation. For years, the men of Aarhus worked only in the commercial fleet. The commercial fleet numbered over a hundred vessels in the eighteenth century. It maintained the existence of shops, banks and stores for goods. In the early twentieth century the city was linked with a railway line, which contributed to the development of the economy. This led to a sharp increase in the population of the city. Today, Aarhus is the second largest city in Denmark, and the second largest Danish port. There are many companies of light and heavy industry here. The city is famous for the September Aarhus Festival, during which a number of theatrical productions and concerts are held. 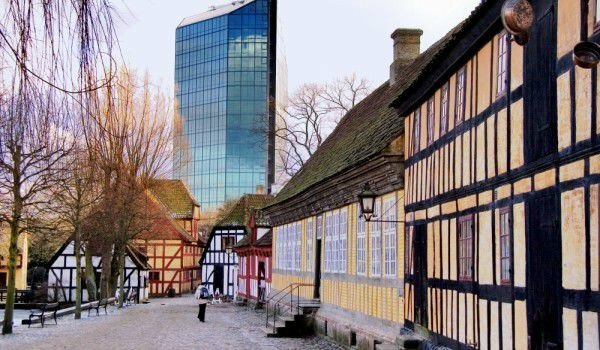 The biggest attraction of the city was founded in 1909, the Museum Den Gamle By. The first home of the museum became the home of the former mayor, who had to be destroyed. Then a few old buildings were moved and the museum appeared. The exhibits there are ever increasing. Today the territory of the museum, known as Old Town, spans seventy-five buildings from the sixteenth and seventeenth century. They come from different parts of the country. Museum staff is always dressed in ancient costumes to be in sync with the ambience of the museum under the open sky. The territory of the museum has shops which are designed to look as shops looked several centuries ago. In the small streets of Old Town, we can often see the old-fashioned carriages, with harnessed race horses. In Old Town there are old mills where flour is produced with old technology. Old Town recently received a new addition – a Mint. Old Town is open all year, except for Christmas and New Year. At the end of November within the Old Town is found a pre-Christmas fair, at which can be bought really interesting souvenirs. Among the popular temples in Aarhus is the cathedral of St Clemens, which was built in the Gothic architectural style. The roof of the cathedral is copper and it is recognized as the longest cathedral in the country. Construction of the cathedral was completed in the early thirteenth century. The temple was originally built in Romanesque style, but in the thirties of the fourteenth century, it was demolished by fire and during the middle of the fifteenth century, it was rebuilt, but in the Gothic style. The temple has frescoes of the fifteenth century and an eighteenth-century organ, which is the largest organ in Denmark. The temple features a gilded altar. The Church of Mary was built of wood and burned by the Swedes in the tenth century. In the twenties of the thirteenth century the church expanded to a nunnery. After the era of the Reformation, the church was restored, while the nunnery was changed to a hospital for old people. In the fifties of the twentieth century, during the restoration of the temple, a crypt of the eleventh century was opened. The Concert Hall of Aarhus provides excellent acoustics for performers, which attract many fans of music.